On BrainPickings I came across a review of an absolutely stunning version of Euclid’s Elements. Produced in 1847 by mathematician Oliver Byrne, the book is obsessively visual like the proof below of the Pythagorean Theorem. I would love to find a poster for my office. Sadly Google came up empty. I did happen to find another 2010 review in the NY Times. You can also buy the book on Amazon. Maybe a holiday present for that geek in your life? 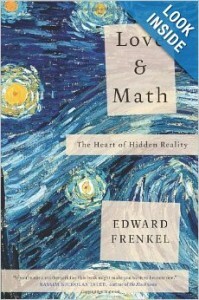 I caught a really promising book review for Love and Math by Edward Frenkel in the New York Times. I’m already 10 books behind on my reading list right now, but I think it’s about to be 11.